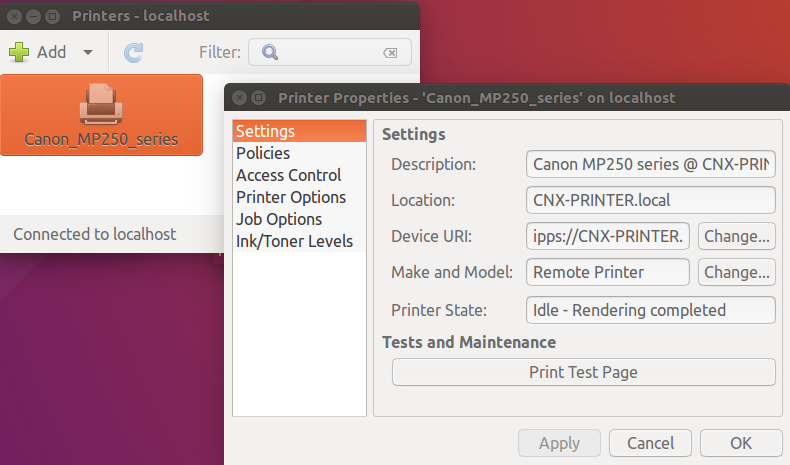 We have a Canon Pixma MP250 series multi-function USB printer connected to a Windows 10 laptop at home, and for several years, I had no problems printing from my Ubuntu computer to that printer. 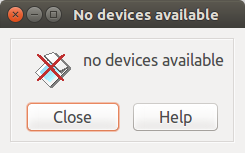 However, this setup recently stopped to work, and whatever I would do, printing would never start from my Ubuntu PC, even though the file was (allegedly) successfully transfered to the Windows 10 laptop connected to the printer. So I decided to setup my own printer server, as well as a scanner server since it’s a multi-function printer, using one of the boards from my collection. As I opened my cabinet, I wondered whether I would use an Orange Pi board, Raspberry Pi board, or Nano Pi board, but I needed WiFi since there’s no Ethernet in the office where the printer is located, and I found that Next Thing CHIP board was the ideal candidate as it comes with a USB port, built-in WiFi, and storage, and I paid just under $15 in total to have it shipped to South East Asia. 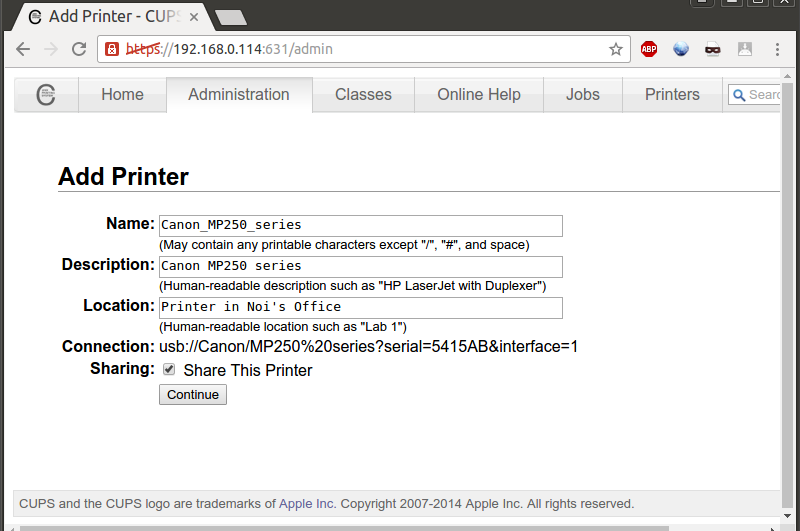 So I’ll report my experience setting up CUPS printer server and SANE (Scanner Access Now Easy) on the board. Those are generic instructions working on Debian / Ubuntu, so they will other work for Raspberry Pi, Orange Pi, Nano Pi board, etc… via WiFi or Ethernet. Alternatively, you could flash Debian without GUI based on the instructions here. Now that the initials setup was done, I could start the printer server setup, with the steps below greatly inspired from instructions on Next Things forums. If you are doing this from a Windows machine, you’ll need mDNS (Bonjour) installed for .local addresses to be recognized, and one way is to simply install iTunes. At this point I could access the web interface by going to http://cnx-printer.local:631/ in my preferred web browser. 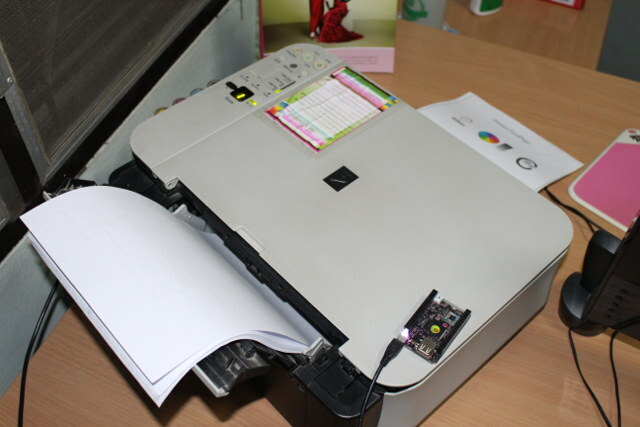 If you have not already done so, you may want to connect the printer to the board’s USB port, and power it on at this stage. Now we can click on Adding Printers and Classes. and then click on Add Printer, which will switch to an HTTPS connection with a self-generated certificate, so you may get a warning, but you can safely add the certificate to carry on. You’ll then be asked for a username and password. Don’t login with chip user, but instead root. The default password is also chip, so you may want to change that in the board. The next page is called “Add Printer”, and my printer was automatically detected. 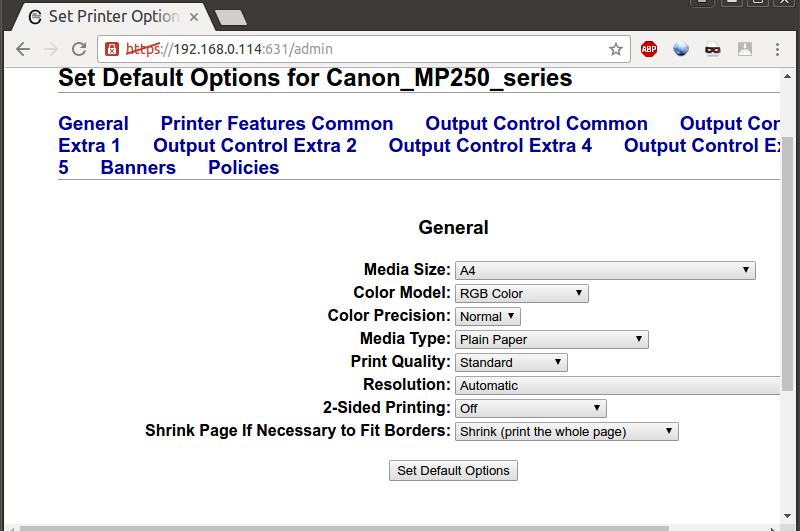 So I selected “Canon MP250 series (Canon MP250 series)”, and clicked on Continue button. You can add some location information on the next page, and also remember to tick Share This Printer, before clicking on Continue. Note that if you’re going to use Windows clients, you may want to note the Printer Name, in my case Canon_MP250_series, as we’ll need it. The next page will show a list of models, but in my case everything was already selected, to I just had to click on Add Printer to carry on with the setup. Finally, you’ll be asked to define some default options, but again I did not change anything there, and clicked on Set Default Options to complete the setup. The next step was to fo the Printers in Ubuntu to see what I had to do to configure the network printer, and the answer is: Nothing at all. 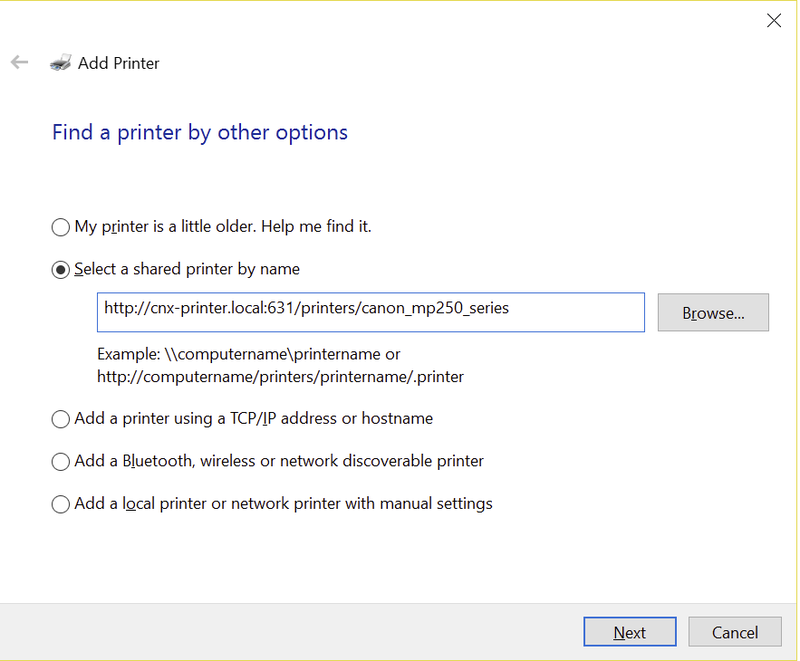 The new networked printer was automatically detected and added to the list of printers. I went ahead, and clicked on Print Test Page, and it worked beautifully, although it started a little slower than usual. But the printer server won’t last long if it cannot work with my Wife’s Windows 10 laptop, so I followed some instructions on ArchWiki. 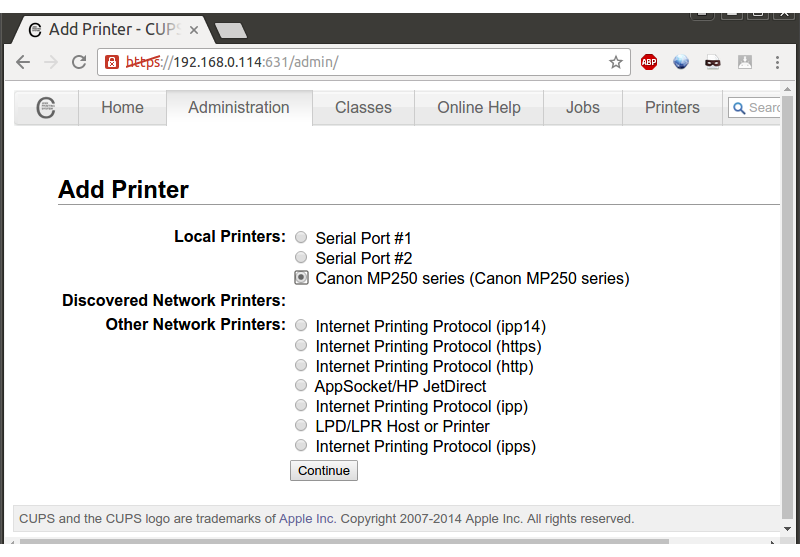 First I went to Control Panel -> Hardware and Sound -> Devices and Printers, and clicked on Add a printer. 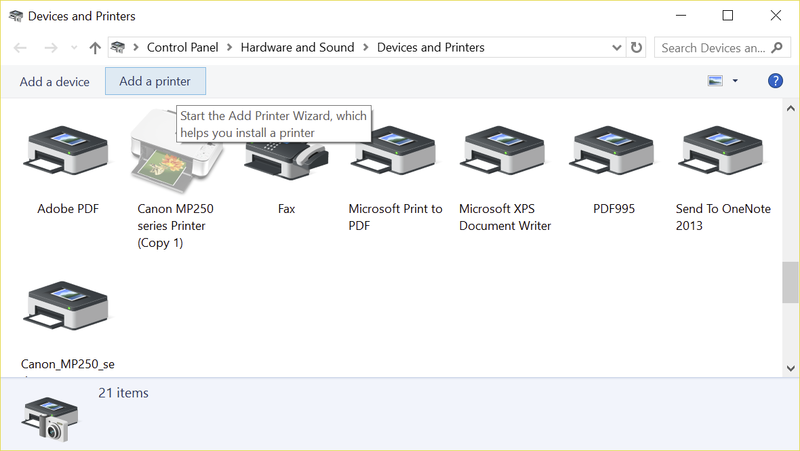 In the next window, you’ll need to select “Select a shared printer by name“, and type the printer name. The URL should look like http://<hostname>:631/printers/<printer_name>, where <hostname> is the IP address or hostname, and <printer_name> the printer name shown in CUPS web interface. 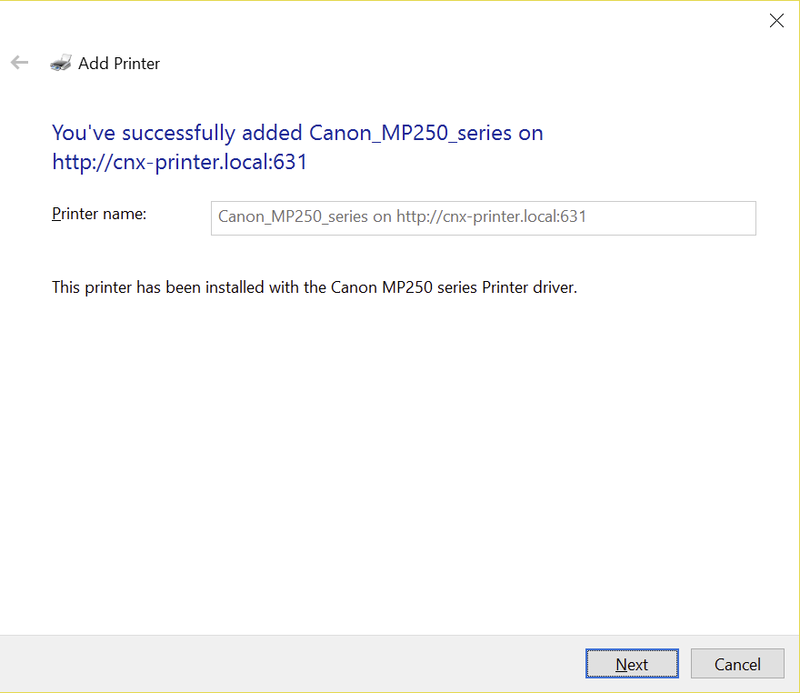 Once this is done we can click on Next, and you’ll be asked to select Windows drivers for your printer, once it is done you’ll get a confirmation the installation was successful. 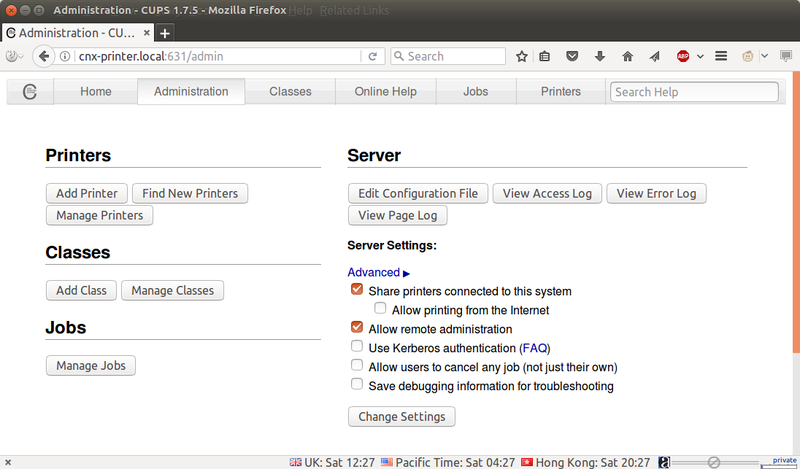 The printing server installation went pretty smoothly, and worked with both Linux and Windows clients. But my printer is also a multifunction scanner, so I’d also need to enable scan function too. 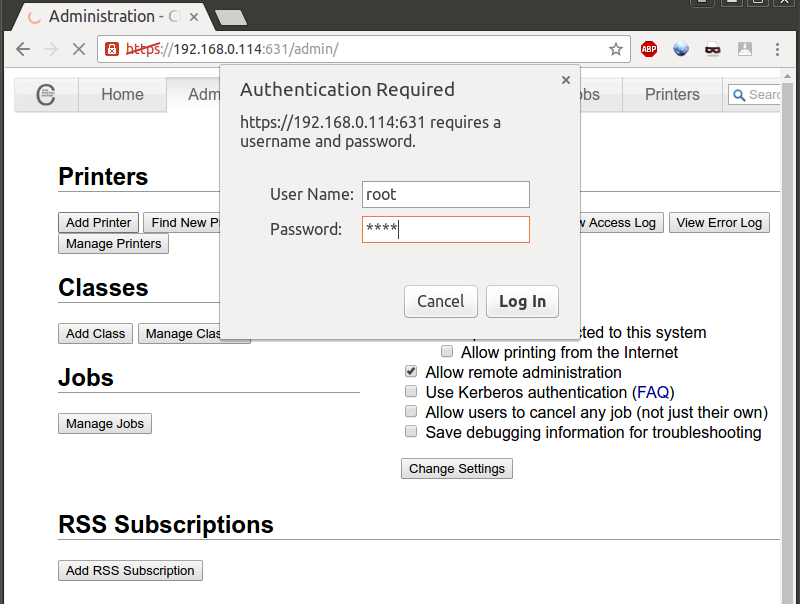 I adapted instruction @ http://xmodulo.com/usb-network-printer-and-scanner-server-debian.html and SaneDaemonTutorial on Ubuntu.com using SANE. I did manage to make it work, but only once. I guess there may be a permission or systemd issue, and I’ll update the post once I find a solution. In the menatine, I’ll still report what I’ve done below. Before we try the scanner over the network, we need to make sure it works locally inside the CHIP board. 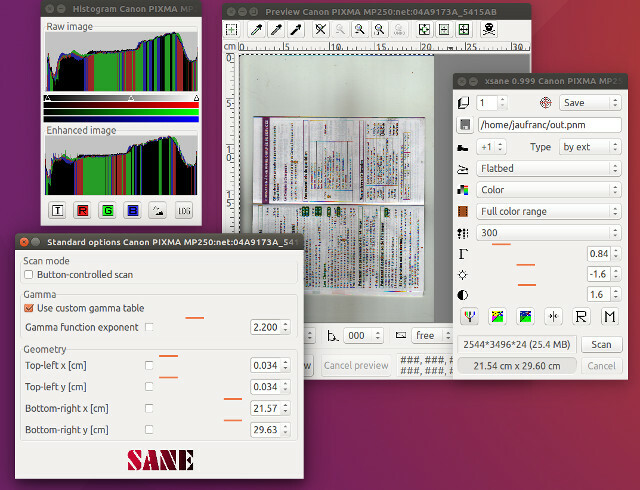 SANE is probably already installed, but to make sure we can install the following packages. sudo sane-find-scanner # sane-find-scanner will now attempt to detect your scanner. If the # result is different from what you expected, first make sure your # scanner is powered up and properly connected to your computer. # No SCSI scanners found. If you expected something different, make sure that # you have loaded a kernel SCSI driver for your SCSI adapter. # Also you need support for SCSI Generic (sg) in your operating system. # If using Linux, try "modprobe sg". found USB scanner (vendor=0x04a9 [Canon], product=0x173a [MP250 series]) at libusb:001:002 # Your USB scanner was (probably) detected. It may or may not be supported by # SANE. Try scanimage -L and read the backend's manpage. # Not checking for parallel port scanners. # Most Scanners connected to the parallel port or other proprietary ports # can't be detected by this program. does not seem right, and would cause systemdctl to report a “bad message”, and the line at the top are ignored by systemd. I tried to edit the Wiki, but I could not due to a gateway error on the site. # This is the net backend config file. # saned host (network outage, host down, ...). Value in seconds. Time to start xsane from the command line or dash for some scanning, except it did not work for me with the window below showing up each time after a few seconds. So I spent a few hours studying about this problem, reading articles online, capturing packets with Wireshark, and trying the same thing on a Windows client with SaneWinDS. I could not find any solution in any articles, but I could see packets exchanged between the server and client, and SanWinDS could connect the CHIP board SANE daemon, but would not find any device/scanner. I could not find anything relevant in /var/log. or dmesg either, so I tried to mess up with the config files, and changed [email protected] to use User=chip instead of User=saned, and success! I could start xsane, and scan a document. So I rebooted, the board to see what would happen, and sure enough it went back to the “no devices available” window. I tried to change that back to User=saned, and reboot, and then try again with User=chip, but I had no luck in all of my subsequent attempts, and ran out of time for the day… The solution is probably close, and I’ll update the post once/if I found out what the problem is. BTW: Isn’t there an ‘apt autoremove’ missing after uninstalling libxfce4util-common package to reclaim used but oboslete disk space? Would be interesting to compare ‘du -h’ output before/after. Great writeup. I’m going to need to do this soon with a printer in my house. I’m currently using a WAP with USB print server, but it was damaged in a recent lightning strike and is acting strangely. I’ll probably use an Orange Pi Zero instead due to availability, though. If you want to replace a ‘dumb print server’ you should keep in mind that the variant Jean-Luc showed is somewhat different. As soon as you add a ‘driver’ in CUPS (assign a PPD) also ‘filters’ are applied. In the above example you can then send PostScript or PDF as spool type and the CUPS host will then render the page’s contents into bytemaps and then translates them in the PDL the printer knows (PDL — page description language). If you want the ‘dumb print server’ behaviour you have to ensure that you’re choosing ‘raw’ as printer type (no PPD assigned). In this case CUPS never tries to apply filters (called drivers everywhere else) and will send the data the printer driver on client machines generated directly and without any modification to the printer. Fortunately this also applies to the situation when you use the ‘native driver’ on a client machine since CUPS determines the MIME type of incoming jobs. If it’s not PostScript or PDF or any of the known/accepted PDL for which incoming filter rules exist it also treats the print job as raw and simply forwards spool data without modification. As already explained above with your setup filtering of print jobs happens on the CHIP now (which is a rather bad choice due to its single core A8 CPU). Using native drivers in Windows spool jobs are interpreted as raw but from your main Ubuntu host you’re currently sending either PostScript or PDF (don’t know whether Linux still uses PostScript or managed to switch to PDF in the meantime ‘already’) and let the processing happen on the CHIP. You might test some large print jobs and then replace ‘Remote Printer’ with the PPD available on your machine (‘Make and Model’ dialog). Maybe even printing the test page shows the difference between processing print jobs here or there. So what about network printers who supports: Language Simulation (IBM PPDS, PCL 5E, PCL 6, PostScript 3) and Remote Management Protocol like HTTP, IPP Network / Transport Protocol LPR/LPD, TCP/IP. No idea about Android but iOS always spools PDF since this is internal basis of everything display in both iOS and OS X (though iOS uses the MIME type image/urf and not application/pdf). 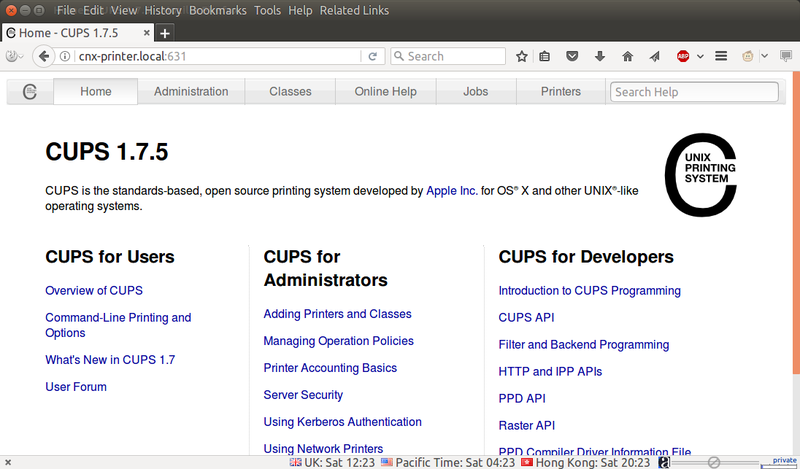 So unless your printer is capable of native PDF processing filtering has to happen on the CUPS host. 2) If you have a real PostScript 3 capable printer that has more processing power than your router (or the CHIP in case of this blog post) then it might be an idea to avoid CUPS’ raster format and convert directly to PostScript 3. CUPS’ pdftops filter (cgpdftops on OS X) can do the conversion which should not need that much ressources compared to rendering all pages and then wrapping it into another PDL later. You have to test through approach 2) since it really depends on processing power of router and printer which device should do the work. Also quality can differ a lot and there are a lot of details to take care of (a bit too much for a comment here). Understood. It’s a printer that CUPS can’t speak to anyway and the only available driver is x86, so I have no choice to make it a raw queue. BS! 150,000 printers were used to print something ‘unauthorized’. That’s a little difference isn’t it: https://www.bleepingcomputer.com/news/security/a-hacker-just-pwned-over-150-000-printers-left-exposed-online/ (check especially the last link there which explains a bit more about state of printer security). So while the suggestion to prevent printers being accessed from the Internet is good (and pretty obvious BTW) and especially PostScript printers can be considered broken by design from a security PoV due to some design principles as soon as a modern CUPS print server is put in front of the device the attack surface of most affected printers is already minimized. CUPS has an own history of security flaws (a lot improved after Apple took over CUPS + lead dev) but that’s a different story. “but iOS always spools PDF since this is internal basis of everything display in both iOS and OS X (though iOS uses the MIME type image/urf” you are right it is image/urfm, when you mean that on internal basis of everything display in both iOS is PDF you mean everything what is send to printer or where else? and can you explain a little bit more use of ghostscript, gutenprint and foomatic type of drivers(openprinting-cups-filters)? In iOS applications just ‘draw’ graphic objects on a canvas be it the display or a printer. The whole graphic subsystem is based on PDF so that’s what you get when printing too. It’s a bit hard to ‘explain a little bit more’ regarding the many different options to filter incoming print jobs. Maybe the most important information is that information you find on the web is mostly outdated as usual (especially mentioning foomatic). Just stay with defaults (AFAIK CUPS’ own pdftops is still based on Poppler lib) and in case the printer isn’t PostScript capable then let CUPS do the work (then pdftopdf and afterwards pdftoraster will be invoked and the resulting bytemap then be wrapped into the printer’s own PDL later). http://superuser.com/questions/985254/installation-of-saned-with-systemd-no-inetd-or-xinetd-saned-refuses-connecti sounds very similar to the problems you have. Maybe it’s related. I think that the sane versions that your Debian uses are old enough to show similar issues. got a cable with my new computer and hooked it up to my computer. Iit worked right away installing the drivers to my Laserjet 5. However it is so slow. I do PDF tax returns and 16 pages takes more than an hour. The exact same document from the old computer to the same printer takes a couple of minutes. I’m a bit confused. 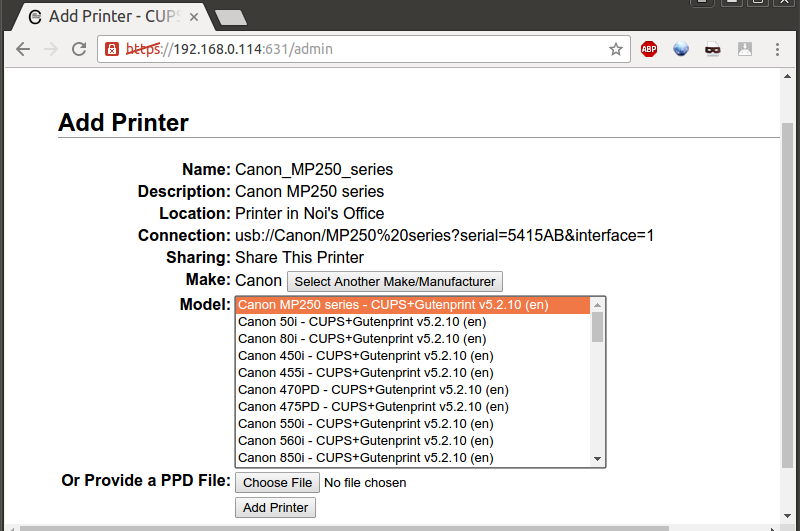 Are you using CHIP board as a CUPS printer server, or are you connecting your printer directly to your computer over USB?